It's not every day we get a classic science fiction film, based on a classic story brought to life on the big screen, enhanced and imagined by one of the most talented film makers of our time. The film is War of the Worlds. The director is Steven Spielberg and after doing years of films about happy, peaceful aliens like in Close Encounters of the Third Kind, and E.T, he got to do what he always wanted to do, a scary disaster film yet packed with unsympathetic aliens bent on the destruction of Earth. 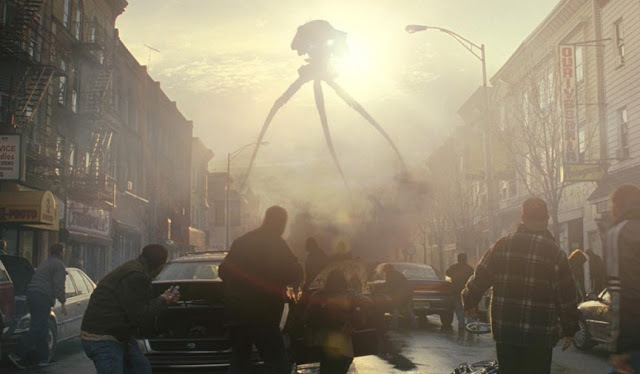 Whether these are aliens from Mars is not really something that is answered in War of the Worlds, and there's a few great questions about why they chose Earth, and why they had machines here before humanity grew to large numbers. What was their real game? Was it us? Were we to be the food and fertilisation of a new species? Before I get into that, let's look at the franchise itself. 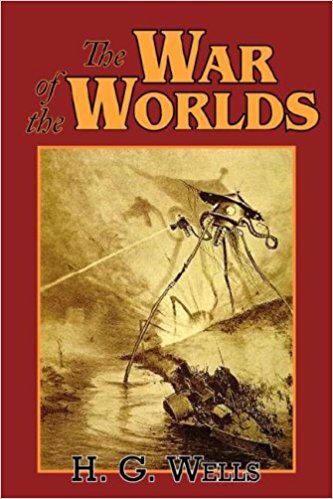 Created by noted writer of the Victorian Era: H. G. Wells, the novel was one of the times, and one of the first truly great science fiction invasion stories. Coming out in 1898 one cannot imagine what people of the time thought of this story, it would have been a shock for sure. (As it would be later on radio with Orson Welles). Decades later the story was adapted into a radio play, infamous for scaring locals and sending worry for those that didn't catch the opening of the radio play, they thought it was in fact real. George Pal produced the classic 1950's film, which is still said to the the best version, and I do enjoy the classic a great deal. 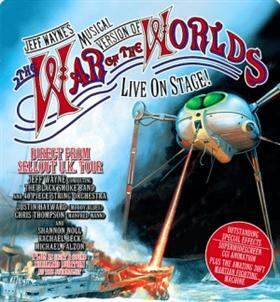 We were then in the 70's with the Jeff Wayne musical version of The War of the Worlds. This is my favourite version of the adaptations to date, and the latest with Liam Neeson taking over from Richard Burton as the Narrator is classic. The live show continues to be one of the best musicals out there, combining the theatrical 3D holographic technology of Liam narrating the music being performed live by Jeff and his band plus the amazing singers he hires to bring the Artillery Man and others to life. An amazing experience. Then Steven Spielberg decided along with his star Tom Cruise, to tackle The War of the Worlds as his next collaboration. In 2003 to 2005 while working on the picture not much was let out to the main media about the project, except a few stills and a trailer that was shown at the Superbowl. What Steven was doing was savouring the thrills and story of what was to be a modern retelling of the Wells classic but one that gave us as an audience a roller coaster ride and shocks, but still at its heart was a family film. It seemed after projects like Saving Private Ryan Spielberg was hardened and ready to face a wearier look at alien invasion, and take it to a darker place. I think what he's done has made his best family film to date. 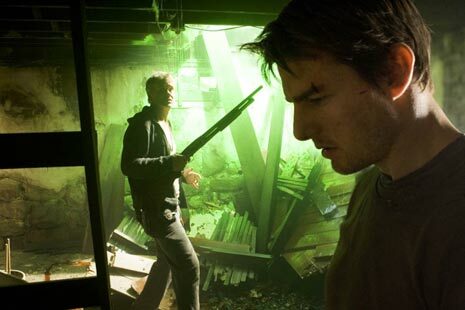 This is what we see for the world of Tom Cruise's Ray Ferrier, a character not in any other version of the stories. However the character is perhaps better, more relatable and more accessible as he's selfish, and inward in retrospection, doesn't care for others, his work mates, or his kids. He goes on his own hero's journey which makes him a more compassionate father figure and one that cares for his family, and mankind. Tom has always had an affinity for playing cool characters with no worries or troubles in the world, and in some ways this characters is just that, Ray is a combination of the over-cocky types he's played, but none of them ever transitioned into a likeable father figure by the end. We meet him at his work, where he is a crane operator by day, and after hours he's a mechanic, and loves putting engines together much to the detriment of the local car repairer who doesn't seem to know what he's doing. He has a Joseph Campbell style call to adventure when his kids are dropped off from his ex-wife, and he must then make his way as a father and look after them while she's on holiday. Ray reacts in the usual way, throws the kids money their way to do what they want, and it only makes them resent him more. It takes an alien invasion to shake him out of his selfish nature and ready to face the realisation he may lose everything. Spielberg's take on the story is somewhat different than Wells, and other versions notably for how the aliens arrive, and that they've been here on Earth before, stowing their ships deep underground. These being the Tripods we see in the film. Far more classical in appearance, and at the same time, hard to believe they'd been kept underground for so long. There's a tough exterior to them, and an aquatic like quality in the way the legs of the tripod move, I found that idea interesting, and ILM did an amazing job bringing the machines to life. The heat ray was incredibly effective I thought less for the visual effect and more for the foley as the sound like an electrical charge was so chilling in the cinemas. The location also was a great one, Bayonne, New Jersey with all of it's modern buildings was reduced to the tone of the original novel when the power grids went down in the film, actively making communication near impossible. It made for an interesting backdrop for the family drama unfolding. It feels like Victorian era almost, with the scenery and the cityscapes, Spielberg chose well for this one as I think it adds to the overall feel of the film. Ray is rested a number of times, and each of these times are the gateways, or hurdles a hero must face. It begins with the kids being dropped off by his ex-wife, and him having to take the call to look after them. The next is when the tripods rise, he goes to see what the damage is being done by the rumbling earth, and apparent quakes. This he finds the foe he will be facing, and accepts the challenge, by running and fleeing back to his home to get the kids. The next is how to get out of his town, he resorts to stealing a car from the local garage, and takes that survivalist level to keep his kids safe. This is the first true part of him being a real father with responsibility. They face as a family the next challenge when they go to Ray's ex-wife's house and they have to eat. He's never prepared food for them before, the scene with him literally dealing out bread like a deck of cards may be funny but you can see he hasn't really done this before, and the change is beginning for him to take the mantle of leadership and being a parent. Obviously he's tested further, but it's a testament to Spielberg's ideas and the screenplay which make this the most rewarding of The War of the Worlds cinema experiences. The story is kept intact in terms of the escalation of events, and the ending which is quicker than you think, as the aliens haven't thought of the microbial life in our planet, bacteria and viruses would corrupt their bodies. Many questions can be pondered on why the Martians were here. Why did they choose Earth? Why were their machines here for thousands of years? What is the red vines? Why have they waited for thousands of years before returning to wipe us out? So many questions however you'll have to figure those out for yourself, as Spielberg no doubt intended. We don't need to know why, but it makes for great speculation after watching the film. 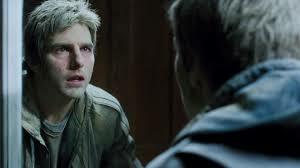 Like Blade Runner, is Deckard a replicant? The answer is totally up to you.